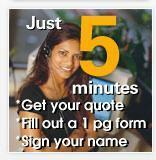 Fast quotes, great rates, totally private and secure. Buying term life insurance has never been so easy. Insurance eligibility and premiums are subject to underwriting. Ronald J Nathan, agent, is licensed to sell life insurance in FL, MI, OH, and VA.